This little number was recommended at the start of my life coach training. Although I went out and bought it right away I didn't open it until, well, a few days ago. Here's the thing about us life coaches, we are trained to be curious, really that's it! That means we ask questions, lots of questions. Here in Mrs. Adams book you meet Ben, the Answer Man, who's sense of curiosity seems to have escaped him leaving his leadership skills less than desirable. Through a series of interactions with an executive coach (life coach for corporate leaders) he starts to close his Answer Man chapter and finds himself thick in the middle of sheer curiosity. Mrs. Adams' premise is that we are either in Judger mode (Who's fault is it? What went wrong? Who's to blame?) or we can be in Learner mode (What are the opportunities here? What do we really want? How may I contribute?). By recognizing our Judger modes and being aware of them we can move into Learner mode to move our conversations some where positive and useful. 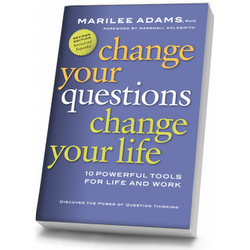 I may have loved this book because it is my job to do what is in this book - but questions are awesome and I encourage you to ask a few more of your own. So, read it.